The Capital Region is turning into a manufacturing hub, serving as a hotbed for jobs in one of the most in-demand fields. On October 14, Troy High School students visited both Global Foundries and Rensselear Polytechnic Institute as part of National Manufacturing Day to learn about careers in the industry. 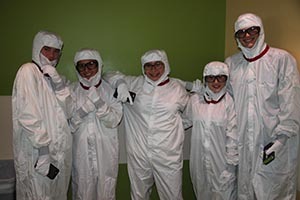 Troy Riverfront P-TECH students visited Global Foundries in Malta for MFG Day @ Fab 8. Students spent the day participating in various activities including a virtual cleanroom tour and hands-on activities at the STEM Fair. P-TECH students, as well as Mr. Baitinger’s Architectural Drawing students, visited RPI’s MFG Day in the Curtis R. Priem Experimental Media and Performing Arts Center (EMPAC) on Rensselaer’s campus. Students joined undergraduate-led team groups, and toured RPI’s manufacturing facilities and student organization exhibits. The day concluded with a Sikorsky UH-60 Black Hawk helicopter landing at RPI. To learn more about Troy Riverfront P-TECH, click here.